Fisher-Price My First Dollhouse - A Great Choice for Years of Fun! The Fisher-Price My First Dollhouse was given to my daughter, Sammie when she was 18 months old and she still loves playing with it at age 6. It was the perfect dollhouse for her as a baby or toddler, and still is perfect. It is so cute to watch her interact with them. I love how she giggles when she puts the baby at the kitchen table. She got it when she was a toddler and thank goodness it is built really sturdy. It has stood up to her dragging it around the house and her dropping other toys on it so many times I can’t count. It came with enough moving pieces to keep her interested and active in her pretend play time. I took a short six-minute video of her explaining what everything is and it is adorable. (She now wants to make youtube videos of ALL her toys! ) You can see it below, but here is the break down on the rooms if you don’t have time to watch the video. What Comes with The Fisher-Price My First Dollhouse? The My First Dollhouse is separated into four rooms, the main floor is undivided, so the kitchen set can be moved around however your little girl wishes. See below the cute details that allow for creative minds to build out the floor space, for the kitchen and the living room. The Mom & Dad’s room is also on the second floor which has a ladder like staircase from the first floor and a balcony off to the side of the house. 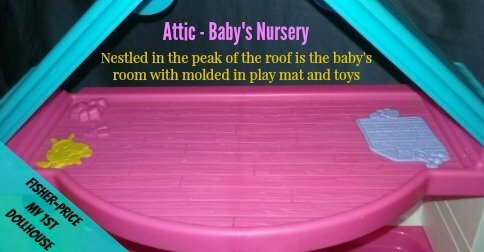 The attic space is set up as the baby’s room, with a play mat and toys that aren’t movable for a nice visual accent. The dollhouse set comes with the Mom, Dad and baby figures, as well as the kitchen with its opening refrigerator and oven, a kitchen table and two chairs. There is no sounds or battery operated parts with this dollhouse, which I appreciated when my daughter went through her ‘let’s make noise’ stage. Her imagination had her making her own noises for a doorbell, a toilet flush and the water running sounds. We purchased a few additional room sets separately to complete the household. 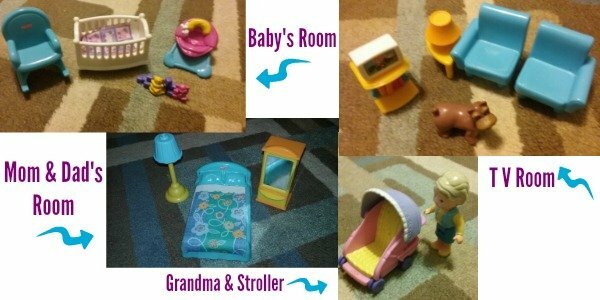 The Mom & Dad’s room, the baby’s room, the living room, as well as the Grandma with a stroller. The set we didn’t purchase was sister’s room because there really wasn’t room for it in the dollhouse without putting it out on the patio. You can see these sets and what they include below. Some of these furniture and accessory sets are still available from online merchants like Amazon.com, but they are actually not carried by Fisher-Price any more and so – of course the price on the pieces you can find are kind of steep in my opinion. Each of these sets probably retailed for about ten dollars back when we bought them to go with Sammie’s My First Dollhouse, and I’m shocked at the prices they are listed for. I think for the most part you would be best to substitute these sets for the ones that Fisher-Price created for the Loving Family Dollhouse series. Or if your child is younger than 3 years old, possibly the sets that coordinate with another dollhouse set. It was disappointing to find that the accessory sets weren’t readily available anymore, as we really felt they added to the imaginative play for our daughter, but if your child is young still, they will enjoy it even without the added on pieces. Now that Sammie is six years old, we are starting to shop around for a larger dollhouse set, and we are liking the Kidcraft dollhouses for their size and accessory packages. You can be sure that whatever one we decide on Sammie is going to want to bring you another video review!